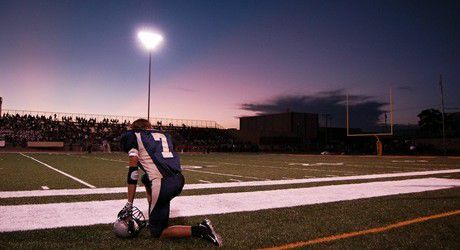 Christians’ misguided fight for football devotions isn’t working. After asking a player to lead the team in prayer, a varsity football coach at an Arizona public prep school recently received a two-week suspension. Coach Tommy Brittain’s punishment has become a rallying point for area Christians who view it as another example of secularism crowding out religion in the public square. Conservative television and radio have fan the flames of discontent, even though the question of whether or not coaches, chaplains, or any other adult may lead public school teams in prayer has long been a settled legal matter. Further challenges have come from atheist groups such as the American Humanist Society (AHS) and the Freedom From Religion Foundation (FFRF). Any football fan knows that religion on football fields and locker rooms is nothing new. Over a half-century before Philadelphia Eagle Heb Lusk kneeled on the field and sent up the first-ever end zone prayer during a 1977 NFL game, a brand of Christianity had already become a familiar fixture in football locker rooms. As far back as 1893, a journalist reported that following its victory over Yale in the great Thanksgiving Day game, the Princeton team, “naked and covered with mud and blood and perspiration,” stood in its locker to sing the Doxology “from the beginning to end as solemnly and seriously, as they ever did in their lives.” Today, prayer in professional football is as predictable as The Star Spangled Banner, so much so that heads are no longer turned when NFL teams meet at the center of the field for prayer after each game.